Ashes, a new short film by Apichatpong Weerasethakul, features Apichatpong's dog, King Kong, and various farm animals. It will open the 16th Thai Short Film & Video Festival on 16th August. It has no dialogue, though there is a voice-over describing "a dream within a dream" (Inception?). There is also footage of a protest against Thailand's lèse-majesté law, kaleidoscopic light patterns, jungle scenes, and a horizontal split-screen sequence. It ends with a pyrotechnical display at a funeral ceremony. The film was made for the Mubi website, and is Apichatpong's second online partnership (after his Animate Projects collaboration in 2009). Ashes was filmed with a LomoKino, a hand-cranked camera that records short film clips on consumer 35mm film rolls. It's like a return to the Lumiere brothers' Cinematographe, which similarly captured only a minute of footage per roll. The lo-tech LomoKino also resembles the PXL (PixelVision) camera from the 1980s, which recorded video footage onto regular audio cassettes. 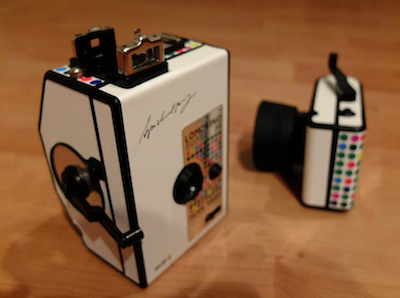 There is even a special Mubi edition of the LomoKino available to buy, branded with Apichatpong's signature. Apichatpong is now most famous for his feature films, such as Tropical Malady, Syndromes & A Century, and Uncle Boonmee Who Can Recall His Past Lives, though he has also directed many short films and videos in addition to Ashes. These include Prosperity For 2008, Vampire, Luminous People, Mobile Men, Phantoms Of Nabua, For Alexis, A Letter To Uncle Boonmee, and the Primitive project. He has hosted two retrospectives of his short films in Bangkok: Apichatpong On Video Works and Indy Spirit Project.